Hi friends! 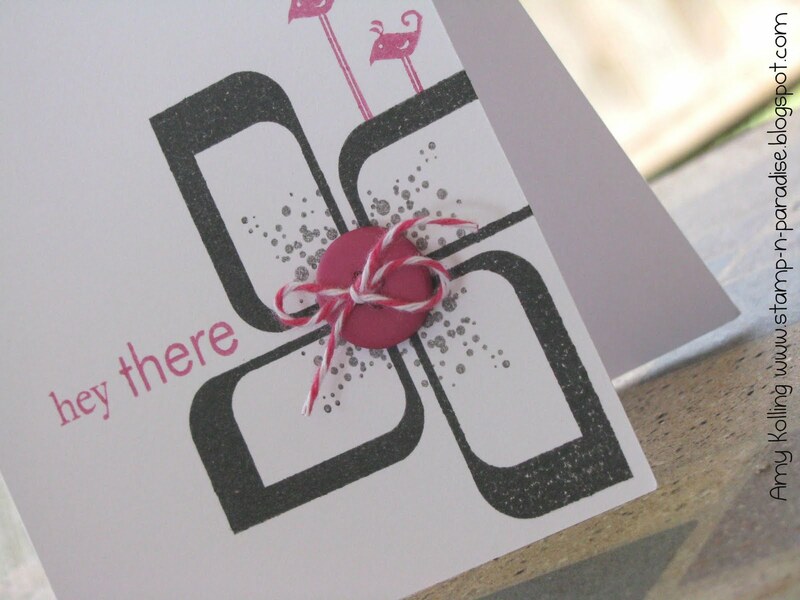 I am here with a card for a special challenge. 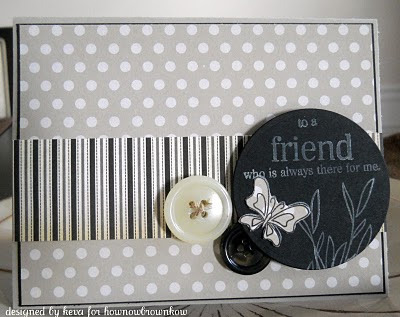 My blog friend, Keva, has a challenge on her blog to CASE a card of hers.....any card. There's even a special something up for grabs if you play along! Thanks Keva and Happy Blogaversary!! Here's Keva's card..........I have had this card saved for ages. This was the card that did me in for this PTI stamp set...Flutter By Friend. Have a great weekend! Busy busy with work and more baseball games! Wow, it's been a week since I've posted! So incredibly busy this time of year in our house.....baseball, baseball, and more baseball! And now that my daughter is playing T-ball, we're even busier! 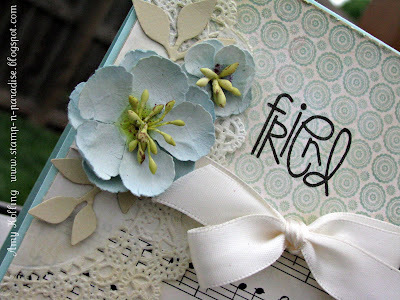 Back to the post today........another Off The Wall Craftiness color inspiration. 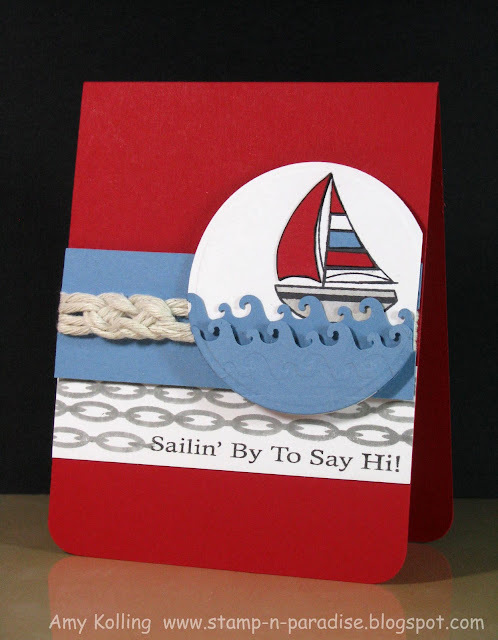 I had so much fun with this week's colors using the newest Wilson Designs stamp set: Nauti-Cool. This is my favorite WD stamp set to date! But you wait.....there is more Wilson Designs goodness to come starting next week! Be on the lookout for the release starting on Monday with a sneak peek! Pretty simple but I LOVE how this turned out! Some paper piecing with the sail using Bitty Box DP from PTI. I wanted the "boxes" to be a bit darker and less noticable so I colored over the paper with my Copic marker. It really made a huge difference. Using my colorless blender, I added some polka dots to the boat! So go make a project and link it up for a chance to win some Wilson Designs stamps! Ok, I have to confess too, that I didn't want Maile's Modern Basics set and after using just this one image from Grunge Me, has me sold. The possibilities are ENDLESS! I will definitely be ordering that with my next order! I had fun making this one so I made another in a different color palette! The middle "splat" image was stamped "off" once and then stamped in the center. 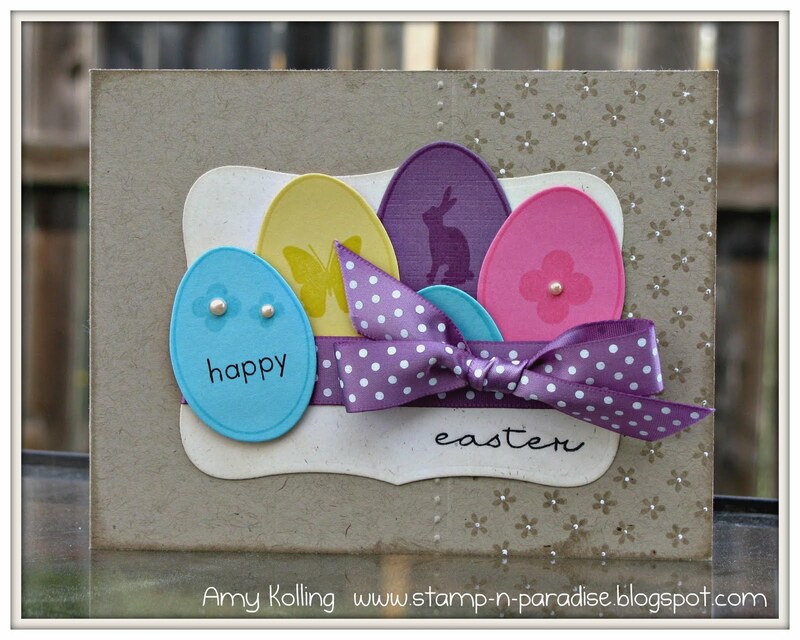 Thanks so much for stopping by and I hope each of you have a wonderful Easter weekend!! 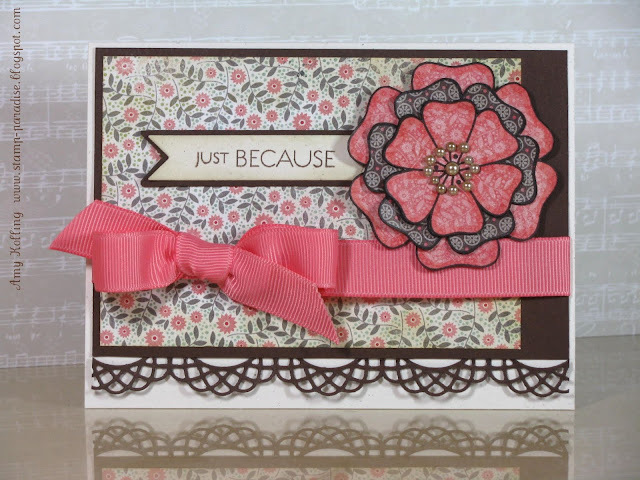 I'm here today with a quick card using some Paper Smooches! 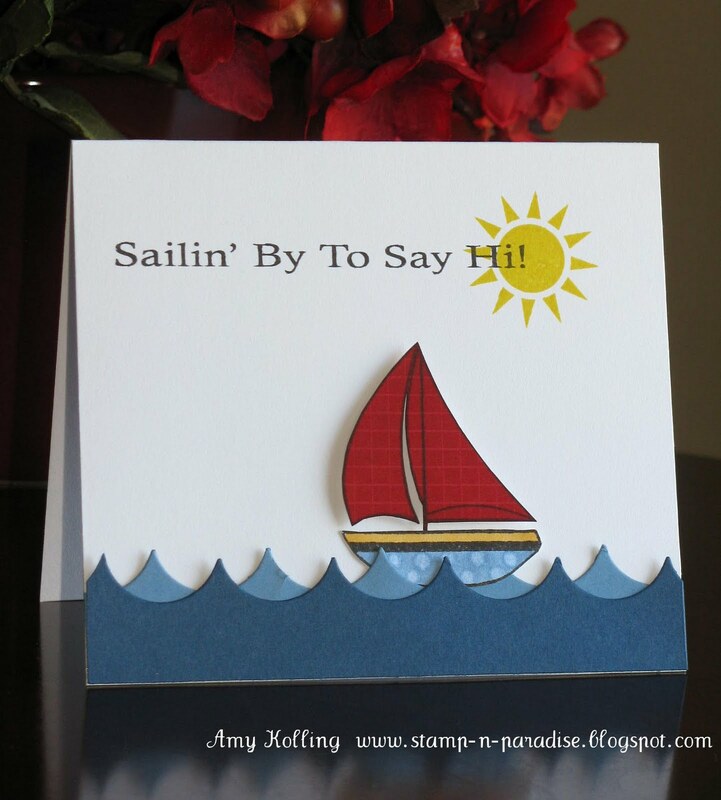 I have enjoyed using this new line of stamps! 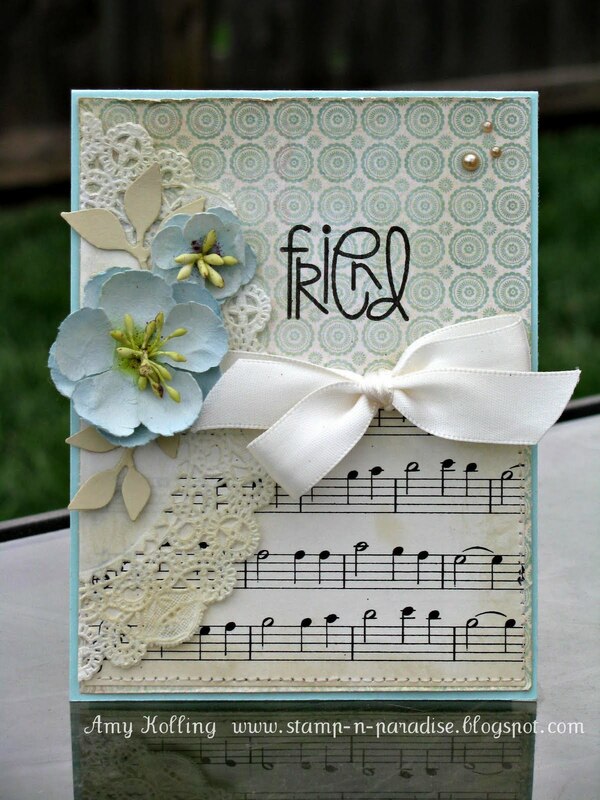 This card uses the Giddy Bugs set. 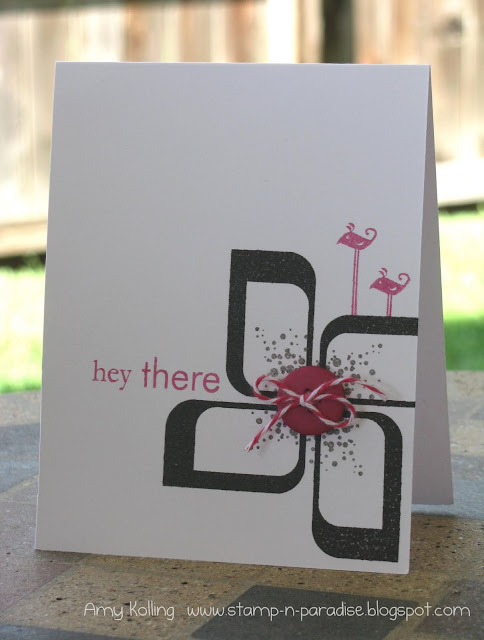 I used a sketch from Clean and Simple Stamping for this one.......but jazzed it up with an EF and a PTI edger die. Also am sending this over to Wee Memories for their challenge this week: All Things Adorable! 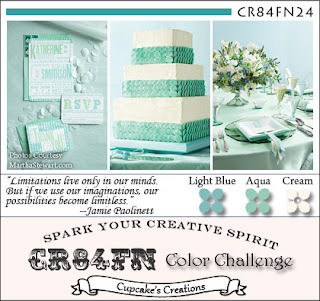 I thought I would share the card I made this weekend for the newest CR84FN color challenge. I love these soft pastel colors and I wanted to use more pattern paper! 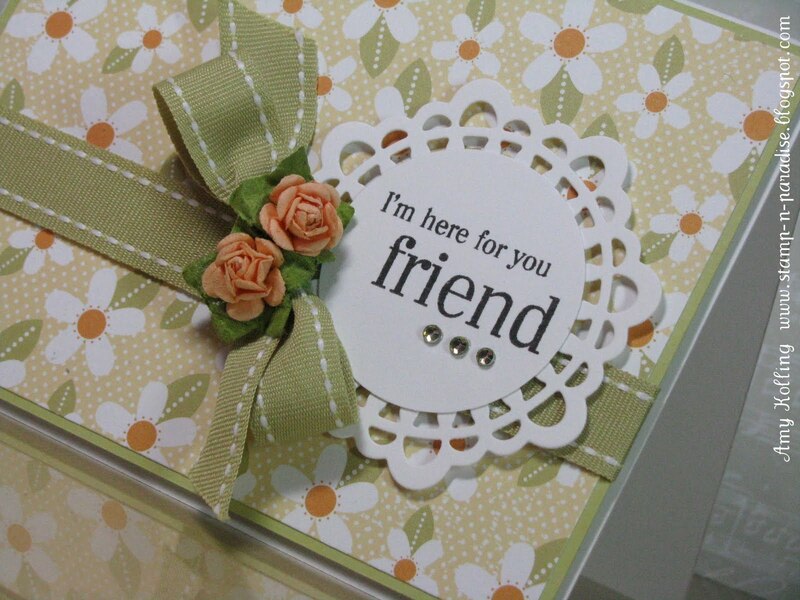 I wanted to also use my new Paper Smooches sentiment stamp set here. I am in LOVE with this set!! You will be seeing more of this for sure! Please don't peek too close as I did a bit of sewing on this to shabby it up a little. I say this as I had a very brief inservice during my Stamping Away weekend on how to sew using an ancient sewing machine I picked up for cheap. So this was my first attempt on a card! Yay! Thanks Jen and Eva for being patient with me and showing me a few things! Here's this week's inspiration photo and color scheme from CR84FN! Thanks for stopping by today! I found this pattern paper last weekend during my girl's weekend.........Fell in love with it. It's so mixy matchy and I love it! I do though have problems with using pattern paper........that's just it......I need to actually USE it! 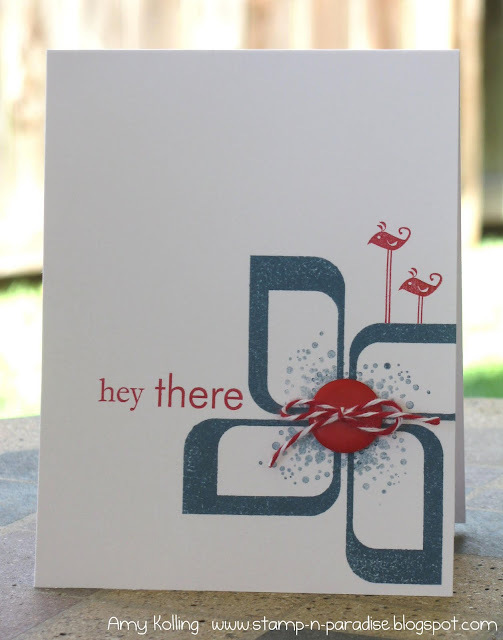 So that's where this card came in and I thought it was a bit "Mish" inspired as well! I also used these particular papers for a challenge my friend Jen has going on over at the Papertrey Paper Dolls. 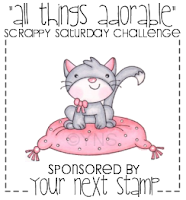 A new challenge went up and ANYONE is welcome to play along! You can check out her challenge HERE. 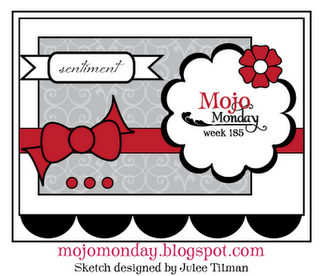 When I saw this week's Tuesday Trigger over at the Moxie Fab World, I thought I should link this up! 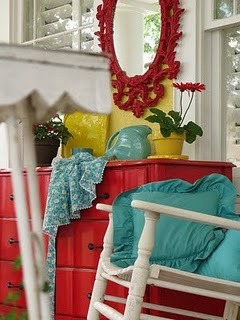 The colors are so inspiring and I love the shabby'ness of this photo!! I can not believe Easter is just around the corner. I remember as a kid LOVING those marshmallow peeps and bunnies! Now, I wouldn't eat one unless my kids dared me to! 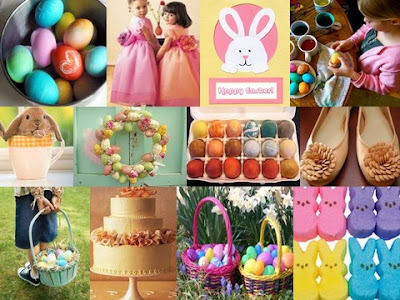 We are planning some egg dying this weekend and some egg hunts! Should be fun. This week's sponsor is May Arts.....fabulous ribbon I tell 'ya. I didn't have any that would match this card but their quality is out of this world. Thanks for stopping by and I can't wait to see what you come up with for this challenge! 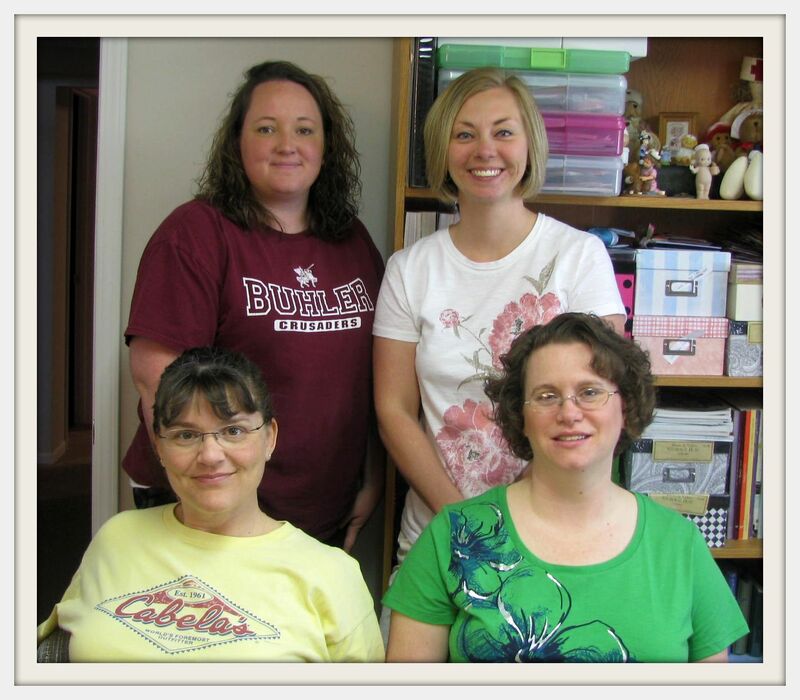 So this past weekend, I hosted 4 of my good stamping friends at my home......Jen, Laurie, Eva, and Barb. It was cozy in my stamping room and I'm sure the accommodations weren't the best in the west but I think everyone that came had a great time. I know I did! So much in fact, I'm looking at my schedule for the next time we can get together! I didn't get as much done as everyone else but I enjoyed watching everyone else creating and soo enjoyed having company to chat and enjoy this hobby together! I have a few photos to share and yes not everyone is represented. My friend, Barb, doesn't do pictures AT ALL. I mean if we sneak one, she isn't a happy camper! So she ended up being our photographer! Here we even had a sweet little helper (in the form of my daughter, Payton) at the Big Shot station.........she helped us die cut our paper and walked around and gave us little notes and told us she liked our cards! Sorry Jen, I know you don't like this photo but it's one of my favorites! This was taken by Laurie on her iphone and edited with the app: Instagram! The added person to this group is Jinny Newlin! She so graciously met us for dinner at the end of our day of shopping in KC! We ate at a fantastic Chinese restaurant: BoLings! 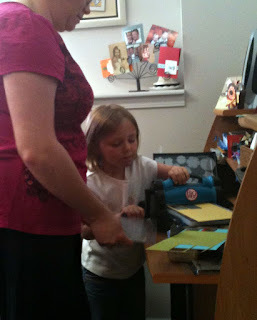 EDIT: I recently purchased this Verve stamp set......I couldn't hold out any longer. Isn't that how it is though? You see it used constantly and then you need it! Now I don't know what took me so long......these flowers are gorgeous for paper piecing and that is one of my favorite techniques! I am so excited to show you all more of what I created this weekend as well as some photos but I'll leave that for another post. Thanks for stopping by! My friends.......Laurie, Jen, Eva, and Barb......are coming today for our Stamping Away weekend! We plan for these a couple of times a year and they are always soo much fun! I can NOT wait! My house is clean (thanks to my sweet hubby who had Merry Maids over the other day as a surprise! ), laundry done, stamp room in order (this is never this way! LOL)......I'm all ready for them to arrive! 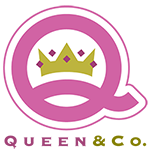 We have some fun things planned........shopping in KC later today and then dinner at BoLings with some blog friends of ours........Jinny and Barbara! Can't wait to meet you girls! On the other hand, my blog may be silent for a few days but I'm sure I'll have lots to post after our weekend! 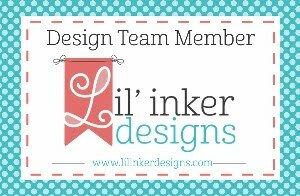 Suzanne and I know each other because we are on a blog group together, Papertrey Paper Dolls. 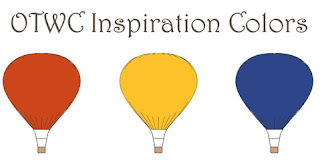 You need to check out our blog and play along with our challenges! They remain open for anyone to play along! Now, I have to show you some goodies that these gals came prepared to give! Oh my....I wish that I'd had more time to make something but I totally ran out of time. But look at what Christina made each of us......crocheted flowers!!! Oh my these are so beautiful! I can't wait to use them.....or wait, maybe I can't use them! LOL Such a sweet handmade gift.....Thanks Christina! Finally, Jessica pulls out of her purse..........these!! This little favor it box came with a sweet treat too.....An Andes Mint brownie! That sure didn't last long! :) Jessica, thanks so much for thinking of us with these sweet little boxes!! I love all the details you poured into these.....the twill, courduroy button and that fun new stamp stamp set! Thank you so much for meeting up with me while I was in Boston!! You all are so sweet! Let's get started on my samples today using Nauti-Cool! My first card is my favorite card of the release! I made a sailor's knot to go along with this set! I've been wanting to make one of these for a LONG time and finally had the perfect set to use it on! 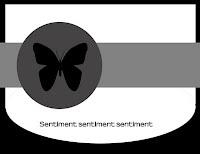 I found the tutorial over a year ago and had it bookmarked for future use.....you can find it HERE. It was super easy and I also used the tip of making a small notch in my panel on the sides to wrap my twine into. Otherwise, this would be very bulky (and it already is). 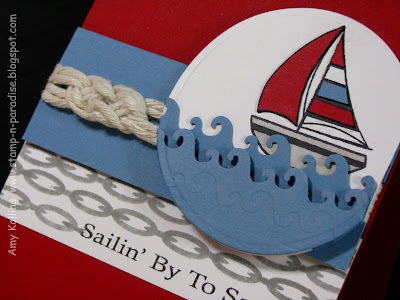 Next, you get another look at one of the background stamps....the chain. Again, very easy to line up. 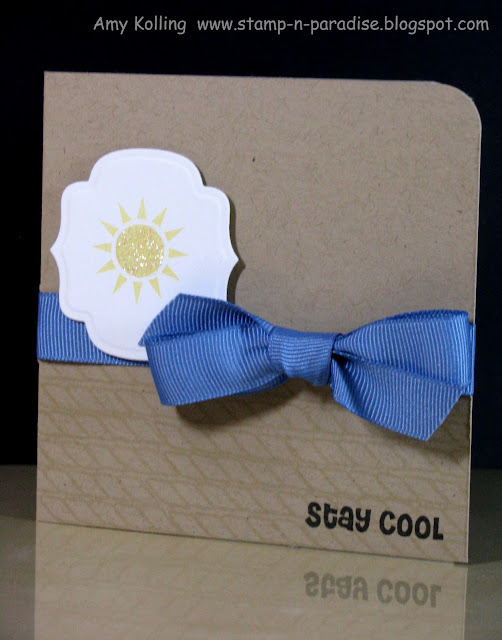 Edit: My card loosely uses the sketch from the JUGS blog for this week! My second card uses some of the other nautical themed stamps in a CAS way via the sketch from Clean and Simple Stamping. I added a little detail and stamped a sentiment! Love this! Alright, so what do you think? I hope you like this set as much as I do! 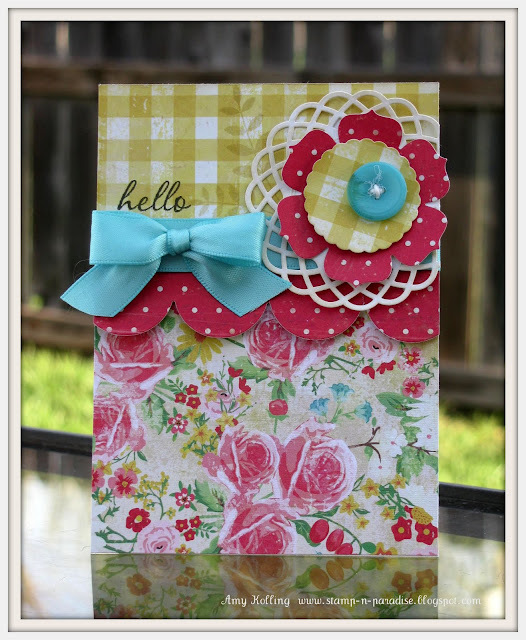 Now go check out the other DT blogs for more inspiration and don't forget to check out our Guest Designer, Maile Belles, too! 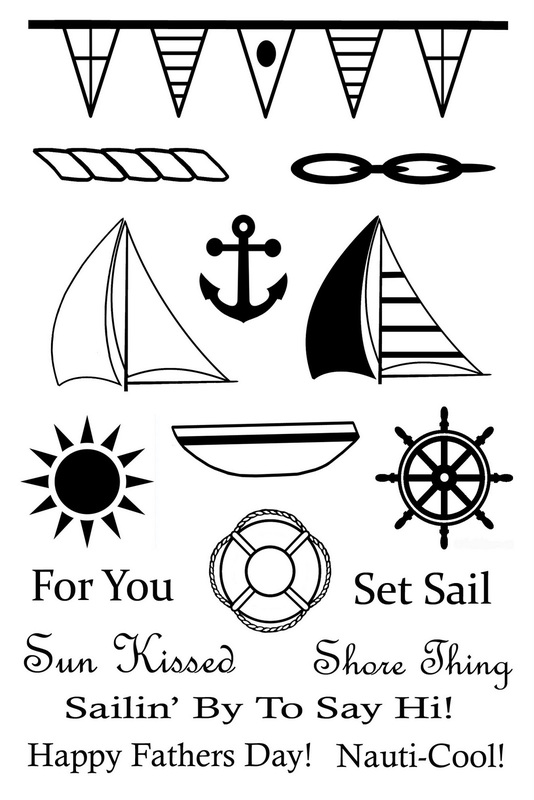 This set will be up for purchase for $12.99 over at Wilson Designs. 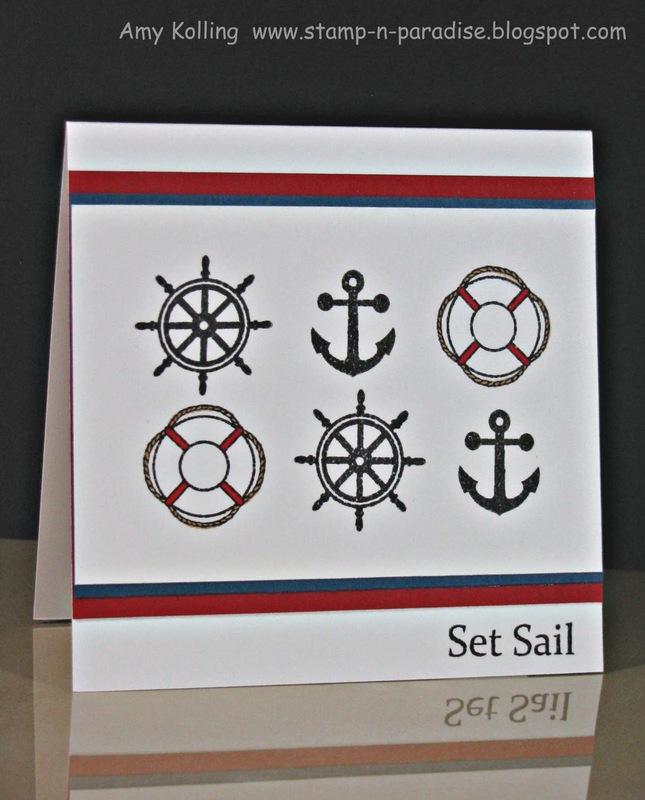 Are you ready to take a look at the newest Wilson Designs stamp set? I can't wait to see what you think of this new set! 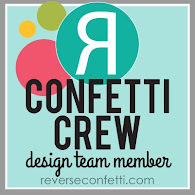 Did you hear who the Guest Designer this month was?? THE Maile Belles!! 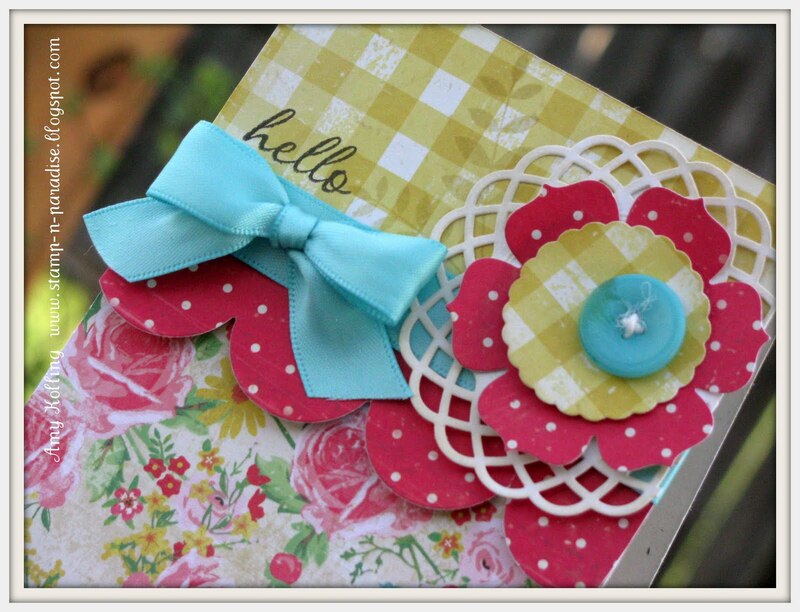 You must go check out her blog as she will be featuring fabulous samples using this set by Kim Wilson! I went CAS with both of my cards today. This set doesn't need anything fancy schmancy!! 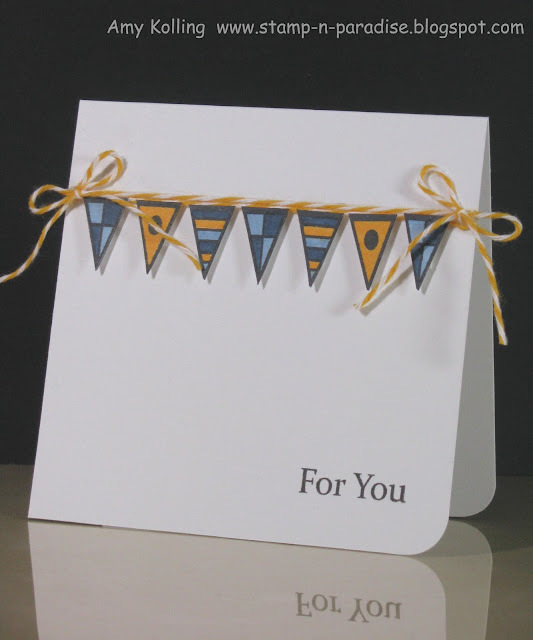 For my first card........I had to make a banner card! 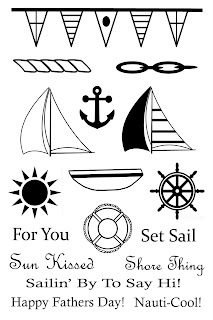 Love the little flags Kim designed to go with the nautical theme. I colored them in with Copics and popped them up on a white card base. Just enough color. Speaking of color......don't you just love that twine? It's the best stuff out there......from The Twinery! 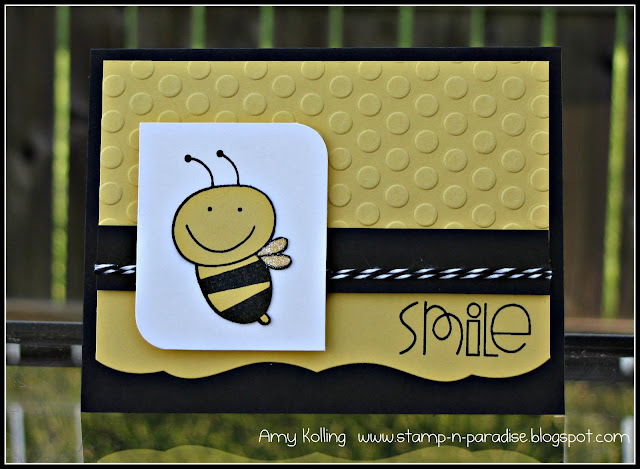 My second card uses 1 of 2 background builder stamps........these I am super excited about! Just look at that rope stamp? It is absolutely the easiest to line up. 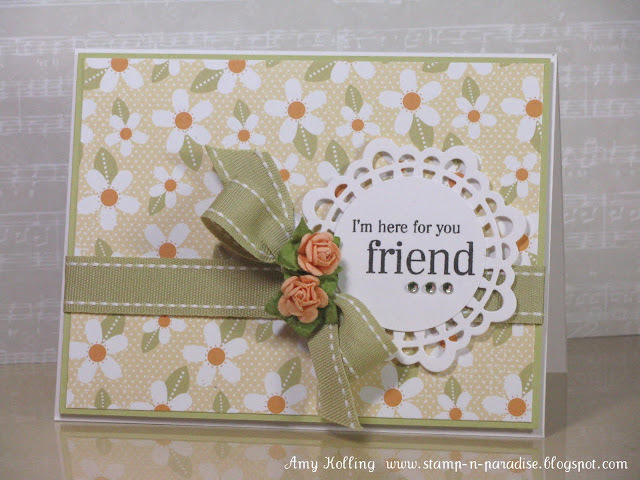 I stamped it in Haystack Pallette on kraft cardstock. That sentiment is one from Snowy Wishes.......I thought it was perfect for a little humor there! That's it for me today but I'll be back tomorrow with my favorite card of the release! Would you like to win this set? Please go visit the other DT blogs and make sure to leave a comment! You never know who's blog the winning comment will come from!! Don't forget to visit Maile's blog too! 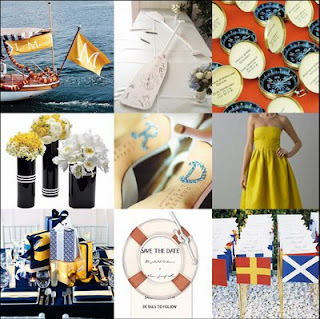 Wilson Designs Sneak Peek Day! Today is the day where I give you a sneak peek of the newest Wilson Designs stamp set. 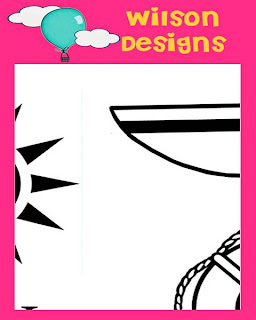 Remember to leave your guess in the comments.......You never know who's blog the winning comment will come from! This month's stamp set is one that filled a void in my stamp collection and it was so fun to work with! Kim is just super creative! Meet me back here tomorrow, same time for some samples using this set!